aiT supports tight integration with ASCET, the state-of-the-art model-based ECU software devel­opment environment from ETAS. You can start aiT directly from the ASCET project editor menu to perform a WCET analysis of the automatically generated ECU code. Automatic WCET analysis of ECU code generated by ASCET. Guaranteed and safe upper bounds on net execution times of software functions in terms of operating system tasks, processes, and interrupt service routines. Entry-level and expert modes for quick or in-depth analysis. Support of ERCOSEK and RTA-OSEK operating systems. 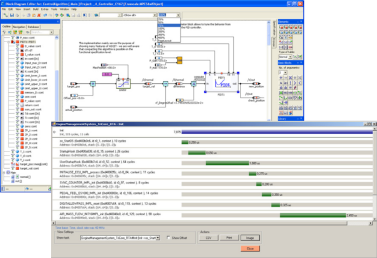 As an input for the WCET analysis, ASCET provides aiT with the ECU software binary and the entry points of processes, OS tasks, and interrupt service routines. The WCET analysis is then performed automatically in the background. When the analysis has finished, aiT reports the re­sults back to ASCET. The report is then displayed by ASCET and provides the user with direct feedback on the impact of changes in a control function on its timing behavior. For further processing, the WCET analysis results are automatically exported in the XTC (XML Timing Cookie) file format. This enables seamless integration with other cutting-edge develop­ment tools. For example, a timing analysis with the scheduling analysis tool suite SymTA/S from Symtavision can then be performed on the basis of the WCET results. The WCET bounds computed by aiT are safe, but at the same time extremely tight. The following table shows a comparison of the highest measured runtimes and the WCETs predicted by aiT for a sample engine throttle control module. The module was specified in ASCET and compiled with the TASKING C compiler v7.5 for an ST10F269 microcontroller board. Run times were extracted from bus traces (iSYSTEMS ILA 128 logic analyzer). The experiment showed an average over­estimation of only 3%. ETAS and AbsInt are working on providing customized ASCET–aiT solutions for a number of target microcontrollers and compiler variants. At the moment, free trial versions are available for TriCore microcontrollers with the ERCOSEK or RTA-OSEK operating systems. For further information, please contact aiT support or your local ETAS sales representative.